This product is based on the knowledge of the ancient Hawaiian Ho’oponopono process provided by Dr. Ihaleakala Hew Len who is popular for the story of healing a whole group of mentally unstable patients using this method. The information was brought to light by Dr. Joe Vitale and Mathew Dixon, after practicing and helping thousands of people using this technique they are now making this knowledge available to all of us through this certification course. If you have explored a lot of LOA based materials then you might already know that these principles teach us that we are responsible for everything that happens to us, in other words, it means that we do have a role to play in everything that happens to us right? Well, according to the ancient Hawaiians we are responsible for everything that happens in the world that comes to our awareness! Yeah, they say that if it exists in “our world” then we have created it, so they have this Ho’oponopono ritual where they ask forgiveness to the higher power/inner self for in whatever way they have caused that particular thing and then they thank the universe by showing an unwavering faith in the higher power that the problem will be fixed. That may sound crazy to you at first, but it has worked miracles in many people’s life. Actually, it is one form of energy clearing using which you can release a particular negative energy pattern from your system. I am telling you, this saga never ends (at least you shouldn’t expect it to end otherwise you will become attached to a goal which is not certain) because we all have a lot of subconscious beliefs that needs to be released from our system so that we can reach to a state that they call “the zero state”, however in the journey you will keep getting better in life and things will start happening in your favor. Learning the process is not difficult, you can do that by reading my above post and Joe Vitale’s book that I have suggested in that post. However, putting it into practice requires a lot of advanced knowledge about the practical use of this technique. I would say, the program has actually shown me how to properly perform the steps, though those four steps are very easy to do, but you need to know when exactly you should use it and also what to do in order make maximum impact on your inner mind. By completing this course and becoming a certified practitioner of this technique (after clearing the exam), you can use it for professional purposes and help others as well. As I have said before, you need a guide for the practical application of these methods than just knowing about it, so this program will actually guide you step by step on how to perform this technique on yourself and others. The program contains videos where you will see the demonstrations of this technique and I believe you must need this if you want to use this particular process to improve your life. This is an eBook that assists you with the program and helps you to properly complete the course. This is the main part of the program where you will get to learn about the process and how to apply it through video lessons by Dr. Hew Len. The videos also feature some other experts who will help you learn this technique better. You will be getting 8 videos which are 6 hours 40 minutes long in total, it covers 8 different subjects related to this process which you need to know in order to successfully apply the method. These videos are actually taken from Dr. Joe Vitale’s zero limits events. 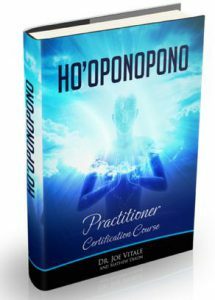 Certification Exam – With no additional fees, you will be able to give an online exam for the Ho’oponopono practitioner certificate recognized by Global Sciences Foundation. As you might already be knowing after reading this post, I am a big fan of this particular method but I have been always looking for more information on it online so it was a real gift to me when I stumbled upon this program and the cost was also reasonable, so I really am very happy with the product. I don’t have any negative opinion about this course because considering the price at which it is available and as you can also become a certified practitioner by enrolling, I don’t think you will regret buying it.